Bill Geivett’s new book reveals some good tips for people who want a career in the game. People want this advice, and a new book by former Rockies Director of Major League Operations Bill Geivett, titled “Do You Want to Work in Baseball? Inside Baseball Operations,” is the only book I’ve seen designed to give it to them. Only, you say? Check around and Google and the best you’ll find are a few webpages with some brief tips. This book contains outstanding material on getting employment in baseball along with a description of what working for a baseball team is like and the mindset and vocabulary needed to succeed whether in scouting, player operations, or in other areas of baseball. In the text, Geivett draws from his 28 years of experience in professional baseball as a player, scout and front office executive to provide an informative and highly entertaining manual on how to get a Major League Baseball job. One of the many things you need to do, Geivett believes, is to be humble enough to evaluate your own strengths and weaknesses and use that to build your brand so that your application can stand out from the crowd. Also, don’t be picky about what kind of job you get. Geivett believes it’s important to get your foot in the door, anywhere, so that you can learn all there is about living the life of an employee of a major league club, including the long hours and somewhat reduced salary. Joining professional organizations, following baseball websites, and going to conventions are all great networking tools that can help this process. If you need proof that this in fact does work, note that Purple Row’s own Jen Mac Ramos parlayed their experience doing these things, including at 2016’s Saberseminar, to become the Assistant General Manager with the Sonoma Stompers. Those kinds of details on building your brand are essential to getting a job, Geivett believes, and he offers ideas and details on how to do so. “What is your speed program in the Strength and Conditioning Department? Adam replied, “I might have to read that then.” It’s not as simple as waving a magic wand. A lot of thinking goes into trying to change an organization, planning for that change and measuring whether the change was implemented or not. As another example of the factors evaluated when making a decision, there is a group discussion of the pros and cons on whether the Colorado Rockies should add Jason Giambi to their roster for the playoff push. Could he still contribute with the bat? 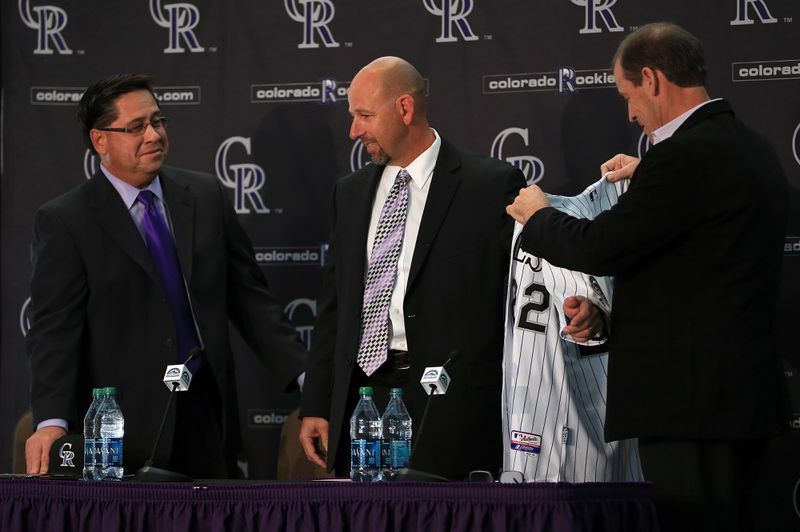 How would the steroid allegations affect the fan base and the clubhouse dynamic? Beyond the statistics, Geivett shows that there are extraneous factors that need to be considered on each decision. One of the other reasons this book is such fun to read are the anecdotes that Geivett provides. Even if you were not interested in working in baseball, I would’ve loved the book just for the stories he tells of his experiences with the Yankees, Expos, Rays, Dodgers and yes, our Rockies. There’s one particular story about the Rockies culture as it pertains to Coors Field that I guarantee will make every reader that’s a Rockies fan look at Coors Field differently, and more fondly. In another, Geivett relates how Vinny Castilla helped him to evaluate a hot pitching prospect in the Rockies organization. Castilla thought the player, though he had a good fastball, wasn’t all that exciting because, as Castilla said, “A major league hitter can learn to time a bullet.” He also discusses how to apply for a job, and Geivett recalls when he interviewed to be General Manager of the Houston Astros and the mistakes he made during that process. Each example from his personal experience that he uses provides an additional bullet point to reiterate the topic of the chapter and provides even more insight into that wacky world of running a baseball team. The book is broken up into three major sections. The first third of the book delves into the many aspects of getting a job in baseball and what kind of work and atmosphere that might entail. The second third of the book covers the elements involved in scouting and projection. While it won’t make anybody a master scout—only experience can do that—the section provides a good vocabulary and context on the hows and whys to evaluate and project players that are necessary not just for those who want to be scouts, but for those who want to be in player operations. Geivett includes a helpful theoretical “test” with two example prospects to give readers some hands-on experience on how to think about players, their tools, and their makeup. The final third of the book puts it all together and discusses player operations in terms of building a championship team. Geivett maps out the types of players needed based on defensive position or pitching role and shows the kinds of tools needed, from a scouting perspective, to create a good roster. For example, Geivett walks the reader through the thought process, the risk evaluation, and the steps of making a highly drafted rookie shortstop become a catcher. Overall, the writing is fluid, intelligent, and quite funny. It’s among the top five baseball books I’ve read in the last decade so, obviously, I’d highly recommend it. It’s right for anyone interested in working on baseball, but I’d also suggest it to those who, while not seeking a job in baseball, enjoy a book with great stories or have ever wondered “just what were those scouts/managers/general managers thinking?” And, when I’m at the SABR Analytics conference this week and I get another question about how to break into the business, I’ll definitely tell them to buy this book. 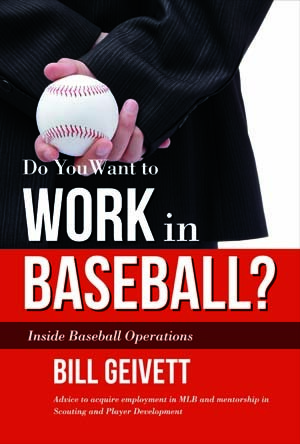 “Do You Want to Work in Baseball” can be ordered in paperback, hardcover, and PDF/Kindle format. If you order and like it, feel free to let me know what you think or reply to the comments. Enjoy!